Like many big cities around the country and world, Chicago city planners made a concerted effort to create plenty of green space within the city. Already blessed with twenty-eight miles of Lake Michigan shoreline, the interior of the city also boasts some of the country’s finest parks. While you likely are not visiting the University of Chicago La Quinta Inn and Suites exclusively to experience Chicago’s parks, this is something you should add to your agenda. Millennium Park, located on Michigan Avenue in The Loop, is of particular interest. This 24.5-acre park within the 319-acre Grant Park is a crown jewel of the Windy City and has something for everyone to enjoy. 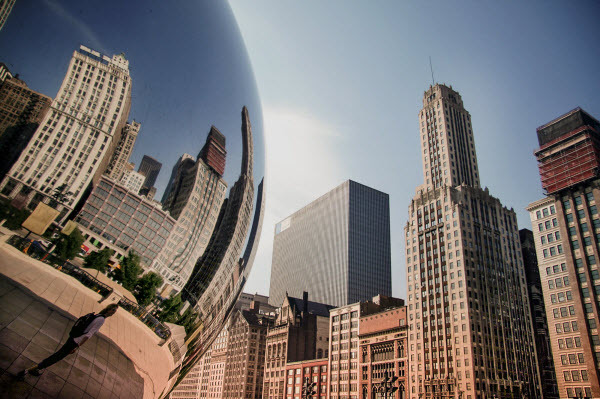 An easy commute from the University of Chicago La Quinta Inn and Suites, be sure to add Millennium Park to your must-visit list during your Windy City stay. Planning for Millennium Park began in fall of 1997, and the park didn’t open until summer of 2004. New by major city development standards, it didn’t take long for this centerpiece of Chicago to gain the notoriety it deserves. Many experts consider Millennium Park to be the city’s most important undertaking since the 1893 World’s Fair, and a lot of locals would agree. Since the grand opening, this park has become the top tourist destination in both Chicago and the Midwest and has more recently cracked the top ten list of tourist destinations in the country – hosting 25 million annual visitors. While at the park, visitors have a plethora of things to explore, not the least of which is its collection of interactive art exhibits. The Crown Fountain attracts kids and adults alike, as they splash in the cool shallow waters during the summer months underneath an ever-changing 50ft tall LED video sculpture. Nearby, Cloud Gate is arguably Millennium Park’s most famous installation. Better known as “The Bean,” this sculpture in AT&T Plaza is made up of stainless steel plates and weighs over one hundred tons. Visitors admiring this work of art will revel in how it distorts both their reflection and the reflection of the city skyline as well. If you have yet to see The Bean in person, we guarantee you have at least seen it on television, in movies, or on your friends’ social media streams. In addition to the art and open spaces in Millennium Park, this section of Grant Park is also home to countless events, concerts, and festivities. The aesthetically pleasing Jay Pritzker Pavilion is worth a visit on its own but, if you’re lucky, someone will be gracing the stage during your visit to Chicago and you can enjoy the acoustics as much as the view. Located a short ten-minute Metra Train ride from the University of Chicago La Quinta Inn and Suites – of which there is a station two blocks from our front door – the beauty and grandeur of Millennium Park is absolutely worth a visit.